Our Crooked Branch: Diagnosis: Nothing. Having two sick kids definitely has an upside. For one, it confirmed my desire to be a working mom versus a stay-at-home one... I love my kids but I think SAHM's must be saints. By 9:30 I was begging to head to the doc for their 11:30 appointments. After feeding her yogurt to the dog, Addi pooped her pants. OK, not a big deal. Except she decided to take them off herself. And then tripped and stepped in the poo. And then tried to run away. SO wrong. After I cleaned that up I went to change Sam's pants and heard Addi ask for a towel. Turns out she wanted to paint her toenails. On my carpet. And her toes weren't the only thing that got painted. Sigh. Anyway, 11 a.m. finally rolled around and off to the doctor we went. After waiting for an hour we got taken back into a room. And waited for another 30 minutes. 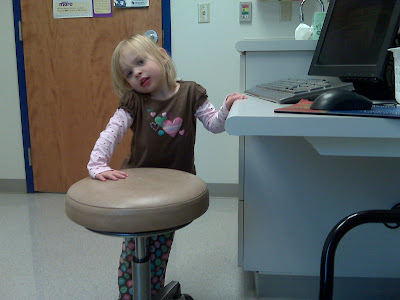 Addi entertained herself pretty well by reading books and spinning the doctor chair during the wait. Finally we saw the doctor and she checked out both girls... All was well until she wanted to look in Sam's ears. Sam started moving around so the doc asked me to hold her head still. Which made Sam cry. Which made Addi start yelling, "NO, mommy, the doctor is hurting my sister!" and try to pull the doc away from her sister. And start crying herself. Such a good big sister. After the check up it was determined that the girls MIGHT have a virus. Fluid, rest and hugs were the medicine prescribed. And some Tylenol for Mommy. This doctor says mommy needs two margaritas and call me in the morning. lol! Love the stories...i can sooo relate.